Unithorns are light purple-colored, partially transparent, rhinoceros-like enemies in Wario World. Their name is a pun on unicorn, a legendary mythical horse with a horn, and "thorn". They are only seen as floating heads and do not appear to have bodies. They can be found only when Wario falls into a pit and lands in Unithorn's Lair. They will try to bite Wario and steal his coins. 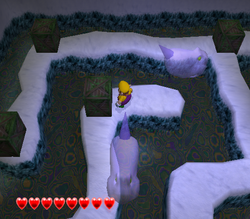 To escape, Wario has to break various crates to find a single one with an Escape Spring inside. All other boxes have Smiley Bombs. Unithorns have a fear of Smiley Bombs as they are stunned for a fraction of a second when one is uncovered. They will be stunned again once the bomb explodes.